The Arctic Circle is one of the two polar circles and the most northerly of the five major circles of latitude as shown on maps of Earth. It marks the northernmost point at which the centre of the noon sun is just visible on the December solstice and the southernmost point at which the centre of the midnight sun is just visible on the June solstice. 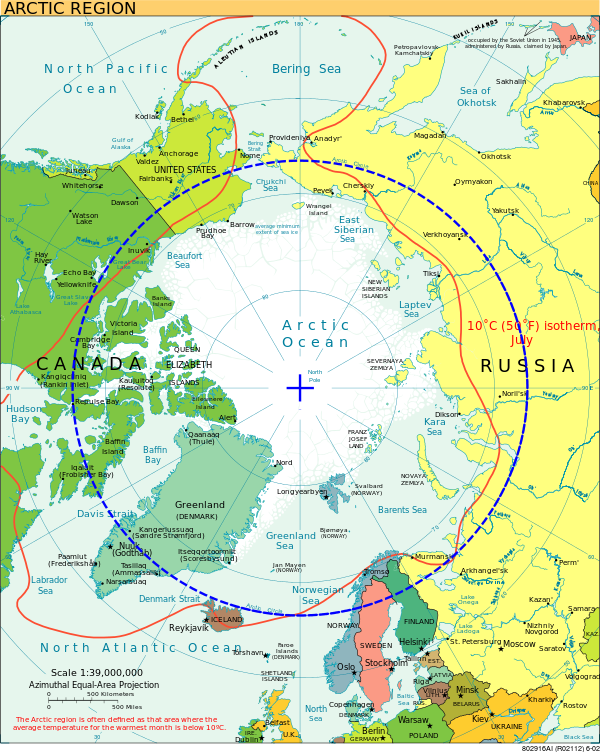 The region north of this circle is known as the Arctic, and the zone just to the south is called the Northern Temperate Zone. The horizon or skyline is the apparent line that separates earth from sky, the line that divides all visible directions into two categories: those that intersect the Earth's surface, and those that do not. 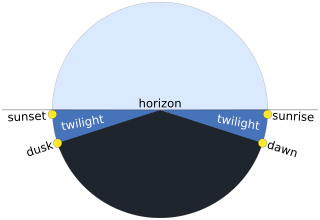 The true horizon is actually a theoretical line, which can only be observed when it lies on the sea surface. 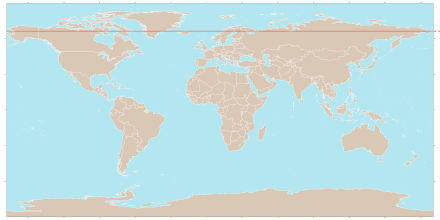 At many locations, this line is obscured by land, trees, buildings, mountains, etc., and the resulting intersection of earth and sky is called the visible horizon. When looking at a sea from a shore, the part of the sea closest to the horizon is called the offing. 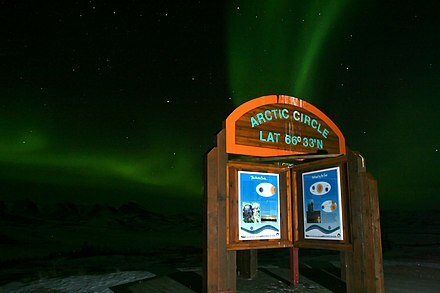 The position of the Arctic Circle is not fixed; as of 6 April 2019, it runs 66°33′47.6″ north of the Equator. 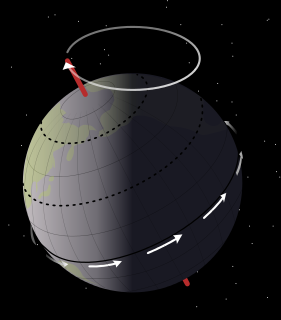 Its latitude depends on the Earth's axial tilt, which fluctuates within a margin of more than 2° over a 41,000-year period, due to tidal forces resulting from the orbit of the Moon. Consequently, the Arctic Circle is currently drifting northwards at a speed of about 15 metres (49 feet) per year. An equator of a rotating spheroid is its zeroth circle of latitude (parallel). It is the imaginary line on the spheroid's surface, equidistant from its poles, dividing it into northern and southern hemispheres. In other words, it is the intersection of the spheroid's surface with the plane perpendicular to its axis of rotation and midway between its geographical poles. Ursa Major is a constellation in the northern sky, whose associated mythology likely dates back into prehistory. 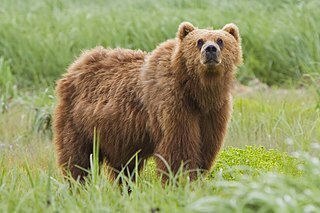 Its Latin name means "greater she-bear", standing as a reference to and in direct contrast with nearby Ursa Minor, the lesser bear. In antiquity, it was one of the original 48 constellations listed by Ptolemy, and is now the third largest constellation of the 88 modern constellations. The June solstice, is the solstice on the Earth that occurs each June falling on the 20th to 22nd according to the Gregorian calendar. In the Northern Hemisphere, the June solstice is the summer solstice, whilst in the Southern Hemisphere it is the winter solstice. It is also known as the northern solstice. Only four million people live north of the Arctic Circle due to the severe climate; nonetheless, some areas have been settled for thousands of years by indigenous peoples, who today make up 10% of the region's population. Tens of thousands of years ago, waves of people migrated from eastern Siberia across the Bering Strait into North America to settle. The largest communities north of the Arctic Circle are situated in Russia, Norway, and Sweden: Murmansk (population 295,374), Norilsk (178,018), Tromsø (75,638), Vorkuta (58,133), and Kiruna (16,936). Rovaniemi (62,667) in Finland is the largest settlement in the immediate vicinity of the Arctic Circle, lying 6 kilometres (4 miles) south of the line. In contrast, the largest North American community north of the Arctic Circle, Sisimiut (Greenland), has approximately 5,000 inhabitants. Of the Canadian and American Arctic communities, Utqiagvik, Alaska is the largest settlement with about 4,000 inhabitants. The Arctic Circle passes through the Arctic Ocean, the Scandinavian Peninsula, North Asia, Northern America, and Greenland. The land within the Arctic Circle is divided among 8 countries: Norway, Sweden, Finland, Russia, the United States (Alaska), Canada (Yukon, Northwest Territories, and Nunavut), Denmark (Greenland), and Iceland (where it passes through the small offshore island of Grímsey). 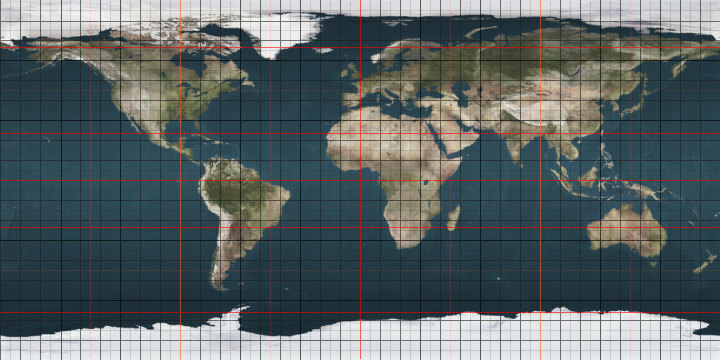 The 73rd parallel north is a circle of latitude that is 73 degrees north of the Earth's equatorial plane, in the Arctic. It crosses the Atlantic Ocean, Europe, Asia, the Arctic Ocean and North America. The North American Arctic comprises the northern portions of Alaska (USA), Northern Canada and Greenland. Major bodies of water include the Arctic Ocean, Hudson Bay, the Gulf of Alaska and North Atlantic Ocean. The western limit is the Seward Peninsula and the Bering Strait. The southern limit is the Arctic Circle latitude of 66° 33’N, which is the approximate limit of the midnight sun and the polar night. Tromsø is a city in Tromsø Municipality in Troms county, Norway. The city is the administrative centre of the municipality as well as the administrative centre of Troms county. The Diocese of Nord-Hålogaland is and its Bishop are based at the Tromsø Cathedral in the city. The city is located on the island of Tromsøya which sits in the Tromsøysundet strait, just off the mainland of Northern Norway. The mainland suburb of Tromsdalen is connected to the city centre on Tromsøya by the Tromsø Bridge and the Tromsøysund Tunnel. The suburb of Kvaløysletta on the island of Kvaløya is connected to the city centre by the Sandnessund Bridge. ↑ Burn, Chris. The Polar Night (PDF). The Aurora Research Institute. Retrieved 28 September 2015. ↑ NB: This refers to the true geometric centre which actually appears higher in the sky because of refraction by the atmosphere. 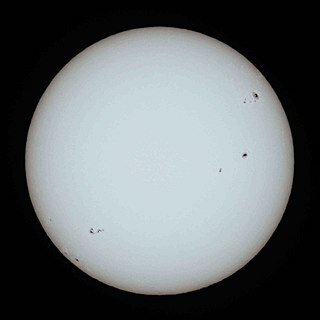 ↑ "Obliquity of the Ecliptic (Eps Mean)". Neoprogrammics.com. Retrieved 13 May 2014. ↑ Berger, A. L. (1976). "Obliquity and Precession for the Last 5000000 Years". Astronomy and Astrophysics . 51: 127–135. Bibcode:1976A&A....51..127B. ↑ Liddell, Henry; Scott, Robert. "Arktikos". A Greek–English Lexicon . Perseus Digital Library. ↑ Liddell, Henry; Scott, Robert. "Arktos". A Greek–English Lexicon. Perseus Digital Library. ↑ Nuttall, Mark (2004). Encyclopedia of the Arctic Volumes 1, 2 and 3. Routledge. p. 115. ISBN 978-1579584368 . Retrieved 26 July 2016. ↑ Marsh, William M.; Kaufman, Martin M. (2012). Physical Geography: Great Systems and Global Environments. Cambridge University Press. p. 24. ISBN 978-0-521-76428-5. 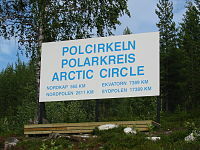 Wikimedia Commons has media related to Arctic Circle .